Forum Index > Historical Arms Talk > Such straight single edge sword in Persia? Posted: Mon 31 Oct, 2016 9:32 am Post subject: Such straight single edge sword in Persia? When I was searching for some messer, I saw this one in swordsite. http://sword-site.com/thread/702/avar-sword-saber-sabre It is Avar's sword and that attract me because it looks like kind of Chinese sword.Is there more information about this type of sword?Did those which owns by Avars relate to China?And in the article it says that it is first appear in Persias in Bronze Age.I hope if there are some pictures of this type of sword which is from Persia. I know much less than I'd like about the history of Eastern Europe, but I do know that it was heavily influenced by a succession of steppe nomad cultures - many of whom travelled across most of Asia, even reaching China. According to Wikipedia (not the most reliable source, I know), some people claim strong historical links between the Avar culture and the Mongolians. However, I am under the impression that the chinese swords which this resembles belong to a much earlier period in history than that Avar sword (weren't the straight single-edged Chinese swords from the bronze age?). If I am right in this, then the resemblance is probably coincidental. The earliest straight sabres like this from Central Asia I know of are from the Caucasus, from about the 6th century. There are still 9th century examples. They were used in Persia too. I don't think it's correct to say that these go back to the Bronze Age. I'm not sure if this is the original tip on this one. 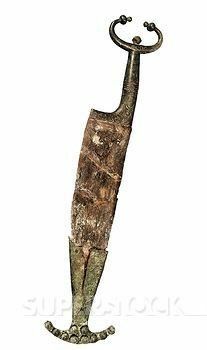 There are some examples from the Caucasus with chisel-tips, but most are spear-pointed or have curved tips (where corrosion isn't so bad that one can see what the original shape was; most are too corroded). Similar blades were used in Tang China. Which way did they spread? These swords usually have scabbards with P-mounts, and P-mounts appear to have spread from Central Asia to China. Given Tang rule over Sogdia (Sogdiana), there was plenty of opportunity for influence in both directions. I don't think it's correct to say that these go back to the Bronze Age. Perhaps my lack of knowledge of chinese weaponry is showing through - I thought I saw superficially similar ancient chinese bronze weapons in a book a while ago. Maybe I misunderstood what I was seeing... Anyway, even if I didn't, I completely agree, the huge difference in time would make this implausible - that's why I said that any similarity is most likely just a coincidence. Similar blades were used in Tang China. That sounds more interesting and plausible. From wikipedia I see that theTang dynasty was roughly between 600-900, so in the right ball-park, yes? I don't know nearly enough about the history of China - I should do something about that! 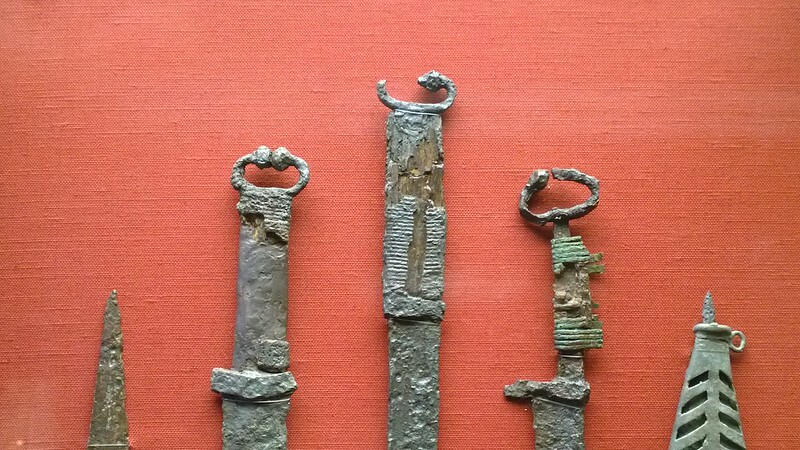 Sassanian swords are rather fascinating. The extent of Iranian power and number of original blades and representations that survive from between the 6th-8th centuries CE makes it seem likely to me that any surrounding regions (such as the Caucasus) would likely have adopted it from the Persians, rather than the other way around. However, the forms of the belts and scabbard mounts on the Sassanian swords is very similar to much older Central Asian examples, harking all the way back to Scythian prototypes, which might suggest such an exchange. That's not to say such equipment had not already deeply influenced Persian fashion by that time, so it's hard to make any determined proposal. This is not my area of expertise and I have not read any published theories. Such forms, of course, could have been spread through a great number of avenues, such as from the Chinese to the Huns to the western Steppes and then down between the Black Sea and Sea of Azov, just to put forth one complex but historically plausible example. I have my doubts that any western predecessors, such as the Celtic-Roman spatha, were influential due to a number of aspects particular to Asian swords and hardware. And also in Han China, in both iron and bronze versions of the dao (perhaps what Andrew had in mind). The origins and evolution of these long straight-bladed swords was centuries earlier than you are suggesting in your previous posts, Timo. 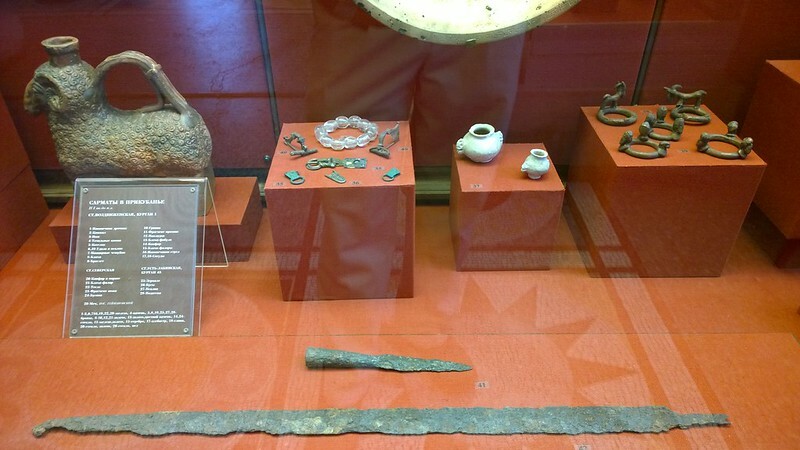 Here are some images of some straight blades discovered in a kurgan (burial mound) near Andreevskaya, in the Krasnodar Krai region of southern Russia (just north of the the Caucasus). They are dated to the 1st-2nd centuries CE. Their resemblance to the Han ring-hilted Dao is striking. And here is a Sarmatian blade dated to the same period discovered at a kurgan in Vozdvizhenskaya, Chechnya. So the Caucasian forms may even predate the Persian examples by a few centuries! It lends credibility to the idea that they permeated the Parthian/Sassanian fold from the north, through frequent struggles in those lands. It also seems reasonable enough to suggest that the Steppe nomads were influenced by the strong armies of the Han dynasty, and would have carried such technology west from China. Although straight-blades are common back to the early Scythians, there is no direct evolution that I am aware of in the swords of the nomads to suggest such radically long and narrow blades as these. So I'll stick with my earlier idea that China-Steppes-Persia was the most likely pathway of adoption. 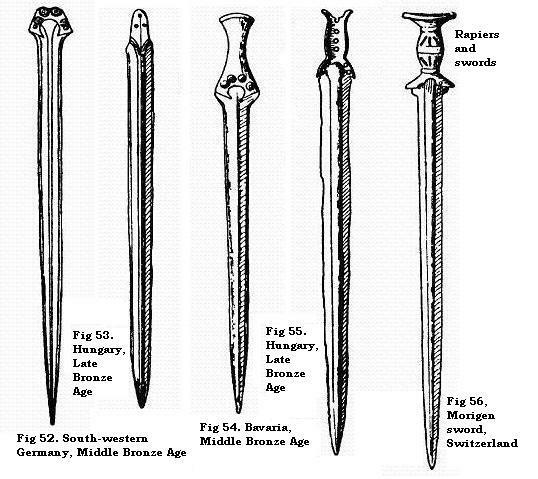 There is virtually no evolutionary line between the long bronze swords of Late Bronze Age European and Near Eastern origin and the later iron examples we're discussing in this thread. Technology changed dramatically and over and over again between the end of the bronze age and the early medieval period. In Iran this interruption consisted of Neo-Assyrian, Achaemenid, Hellenistic Greek, and Parthian cultures, all of which had their own unique forms of armament and swords that derived few, if any, of the technological or aesthetic features of LBA long swords. Most critically, just as casting technology was reaching a pinnacle and long sturdy swords were being cast from complex bronze alloys, iron took over as the favored material. This required a totally new set of skills and understanding, and blades shortened again throughout the Mediterranean and Near Eastern world to compensate for the initial weaknesses in forging technology. For example, in Achaemenid Persia the favored sword was the relatively short akinakes, and in Greece the xiphos and Rome the gladius. 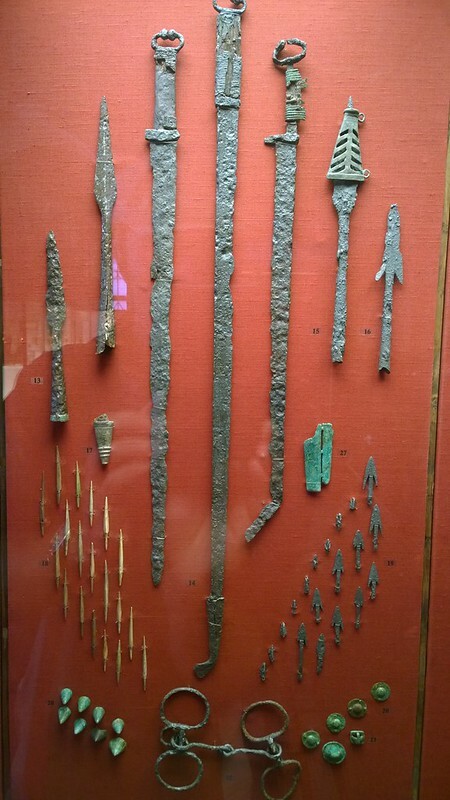 All of these swords had no connection to the bronze blades being cast several hundred years earlier. It's important to remember that you're looking at trying to connect dots between 1,200 years of history, which is an immense amount of time in any region of the world. Iran and the surrounding regions all changed dramatically during these centuries, and few vestiges of bronze age culture and society remained by the Sassanian period. For the reintroduction of long, narrow blades in Persia, we need to look to contemporary weapons used in neighboring or influential regions. Well,I don't know much about Persia,so I am not sure about whether Chinese swords effect Persia or not.But I know that during this period of Tang Dynasty,there are noticeable records suggest that Hu(people from the west) style was quiet popular in China at that time.Not only sword but also clothes,music,food,decorations etc.It was a noticeable fashion in China.And there are some single edge swords in Persia before that time were already appear.And yes they were similar to some Chinese swords.But I doubt that they were from China because that sword type is not very individual in the world(Viking's single edge sword have similar shape but broader). Those ring pommels could very well be related to that Celtic style. Where is that particular dagger from? Celtic groups mingled with nomadic people of the western steppes during late antiquity, and each had an array of subcultures that varied between regions and time periods. If that dagger is from the east then I could see it being a plausible relative, but if it is from England then it is an unlikely candidate. Some comments about connection between the Han and Tang swords below (Gregory gives us some interesting (and new to me) swords). Han rule also extended a long way west, but IIRC not past the Tarim Basin (Han trade and cultural contact went much further west). It depends on whether we say that the Han ring pommel dao was similar to the Tang dao. The blades are similar, but the pommels (ring vs non-ring) and scabbards (scabbard slide vs P-mounts) are quite different. Beyond that, the many centuries gap between Han dao and the earliest Caucasian (or any other Central Asian) straight sabres I new of, made me reluctant to connect them. The ones you show below are new to me, and might just be an evolutionary connection between the Han dao and the 6th-8th century swords.